On Saturday, November 6, the Servant Sisters of the Home of the Mother and a group from Fabero were able to accompany the Holy Father on his visit to Santiago de Compostela. The Sisters, along with 3 young people (Laura, Ester, and Marcos) and an adult (Maria Luz), went along with the diocesan pilgrimage that had been organized by the Youth Ministry Department of the Diocese of Astorga. Everything began on Friday, at 6:30pm. We went to the bus station in Ponferrada to meet up with the rest of our group and head off to Santiago. There were a total of 2 buses with 95 people, including 5 priests and some of the seminarians from the Diocese of Astorga. We are so grateful for the work carried out by the priests, especially Fr. Enrique who is in charge of youth ministry in the diocese, for his dedication in leading the group and watching out for us all. When we got to Santiago, we picked up all our things (backpacks, sleeping bags, food) and went to the Church of “San Francisco,” where there was a Prayer Vigil scheduled at 10pm. The Vigil was led by Archbishop Julian Barrio of Santiago and was attended by Spanish bishops, priests, religious, church movements, dioceses, etc. The Archbishop spoke on how to prepare ourselves interiorly with joy for the following day that we would spend with the Holy Father. A highlight from the Vigil was the testimony of a young, recently married couple who shared their experience from World Youth Day in Cologne. The Archbishop exposed the Blessed Sacrament for a brief time of prayer and adoration in silence, and after giving thanks to God, the Vigil ended with Benediction and the singing of the Salve Regina to Our Mother. As Fr. 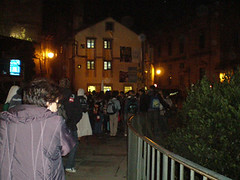 Enrique had noticed that the line was forming to enter “Plaza del Obradoiro,”where the Pope would celebrate Mass the next day, we all went over to start claiming spaces and spend the night waiting until the gates were opened at 8am. The Lord gave us great weather, no rain and a perfect temperature. Also, the environment and attitude among the people was very positive. Everyone was serving, generous, and joyful. The police force did a great job, always ready to help and maintaining safety and calm during the night. Although we made several attempts to dose off a bit, there weren't many possibilities, but the night passed quickly. 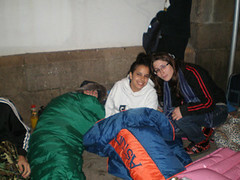 Around 7am, we picked up all our things and got in the line to enter. We sang songs together and this helped lift our spirits once again. Thank yous to all those who made the effort to lead us in those hymns of praise! The long-awaited moment finally arrived: 8am. The gates were opened. We were able to enter the square and claim seats! It was worth the sacrifice because in the end our group had great spots, right behind the reserved seats in front of the altar. 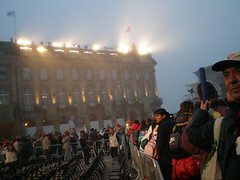 But, we still had 5 hours of waiting left before the Pope's first greeting in the square. 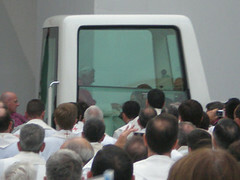 Thanks to the screens set up in the square, we were able to watch everything, starting with the arrival of Benedict XVI at the Santiago Airport. Finally, at around 1:30pm, the crowds in the square went wild as the Pope exited the Cathedral to greet them. What an incredible moment! 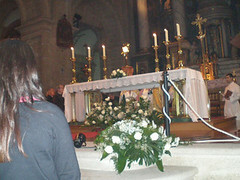 Benedict XVI's greeting was met with a roaring applause and he then went back into the Cathedral to pray before the remains of the Apostle Saint James and give the saint's statue the traditional embrace of the pilgrim in Santiago. He gave a brief address to the bishops, cathedral canons, religious, and those inside the Cathedral. And, as we could tell from the shots on the screen, the Holy Father really enjoyed watching the “botafumeiro,” the giant censer that swings across the nave of the Cathedral. 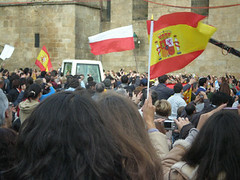 At 4:30pm, he returned to the “Plaza del Obradoiro” to start the Mass. He came down the main aisle with the popemobile. It was so inspiring to hear the affectionate shouts of the crowd towards the Holy Father, especially from the young people. 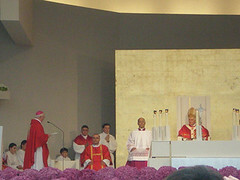 The Mass was very beautiful and we were able to follow it well. It ended around 6:30pm. We all waited in the square, to give the Holy Father our final farewell before he would take off towards the airport, to catch the plane that would take him to Barcelona. We were all filled with an amazing joy! Then, getting our entire group together and getting back on the bus home was another miracle. We were exhausted when we got back, but very, very happy we went, that's for sure.